I don't find God within the walls of my church very much at all anymore. I've stopped expecting to. I don't feel particularly sad or necessarily alarmed that I don't. It's just my reality now. I find God in doing. It's in the action that my heart is fully into that brings me closer to him. I find him in my searching and questioning. I find him in the nights I spend reading and researching, in my looking for answers. In that unknown space where my doubts meet the truths I used to hold, I feel him nearer and stronger than ever. I find him in raising and teaching my children, in caring for my family. In the loosening of my grip on my own selfish wants to better serve those I love, I'm better prepared to die to myself for his greater purpose. I find him in heartache, in particular when I ask him to break my heart for the things that break his. I find him in picking up the pieces. I find him in loving, and listening, and reaching out to others. When I first read about the Rainbow Mormon Initiative, I knew right away I wanted to participate. 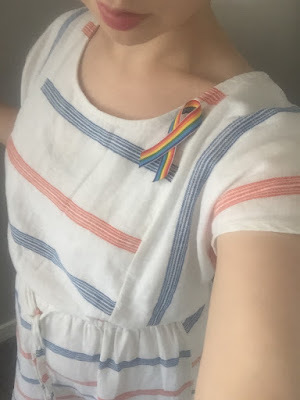 It's incredibly simple- one wears a rainbow ribbon to church every Sunday to show solidarity and support for LGBTQIA youth and adults. The whole movement conveys the inclusion and love that is so needed, yet largely absent. Do I think that love and inclusion alone will get to the core of a very real, very devastating problem within my church? No, but it's a start, and a crucial one at that. It is action. It is doing. This small, simple act is bringing love and God to a space that, for me, has seemed to be void of both. So I did it. I went to the craft store and found the only spool of rainbow ribbon there, while my one and two-year-old tossed a good portion of the rest of the aisle into my cart. I spent just a few minutes cutting and gluing, making a few extra, on the, albeit hopeful, off chance anyone might want one. I've worn it to church each time that I've been this month. I've gotten several questioning glances, and a decent amount of disapproving ones. I've had a few discussions about it, and I've indeed passed out four ribbons. It's easy. It's so easy. The presence of rainbows in Mormon church buildings isn't new. Rainbows are widely viewed as a symbol of God's kept promise, of Christ's second coming. Our children sing songs about rainbows in primary as a symbol of hope and peace. Symbols are not unsubstantial. We must be aware of the weight they carry. Last Saturday, I stopped at a red light on my way to Costco. As cars slowed to a stop across the intersection, I noticed a large truck with a confederate flag in the back. I don't get angry about much, but this flag, this symbol of oppression, and violence, and hatred infuriates me. There are those who make claims to its history (which is telling, clearly), its supposed place in entertainment, its place in a certain culture. Call it what you will. It's hate, and such display has no place anywhere, but it's especially puzzling to me why anyone would have it in Utah; we are far from the south, and outright hatred seems to be the only explanation. Sheer stupidity is a contender, but I feel that gives those who fly it a little too much leniency. People can be stupid, yes, but owning and flying the confederate flag is rooted in hatred and oppression. To knowingly have and display it, aware of what it signifies, shows a complete lack of regard for the lives and experiences of so many. And really, to be alive in America today is to know what that flag symbolizes. I saw two more confederate flags that day. The next morning, I woke up to the crushing news about the shooting at the gay nightclub in Orlando. Hatred baffles me, to put it lightly. It goes beyond what I can comprehend. I believe that no greater evil in this world exists than the pure hatred one person can have for another, and that hate is the fuel behind the most unthinkable acts. Alice Herz-Somme, who passed away two years ago as the oldest known Holocaust survivor said, "Hatred eats the soul of the hater, not the hated." I believe she's right. I believe that when someone hates so deeply, it destroys a part of them. I recently watched a documentary on the institutionalized abuse that ran rampant in a reform school for children in Florida. One survivor, now advanced in age, recounted the horror that he faced as a child from his abusers and stated that, "[the men] had lost the part of them that made them human." To have compassion toward one another is human. In the end, love and peace will win. As for the here and now, hate exists, at times overwhelmingly so. But we don't have to fuel it. We can stand up to it. We can work to dismantle it. Little by little, through the smallest of acts- educating, inclusion, listening, love. That's where I want to be.